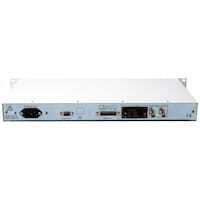 The Metrodata FM4000 DSU is used to interface high performance DTE equipment such as bridges or routers with X.21 or V.35 interfaces to structured or unstructured E1 G.703/G.704 2.048Mbps leased line services. 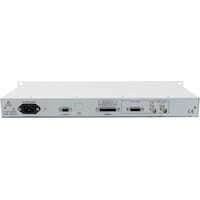 The FM4000 offers conversion between an X.21 or V.35 serial interface and an E1 line interface with BNC or RJ45 connector options. The FM4000 supports both unframed and framed (or fractional) operation. The FM4000 has several LEDs for displaying current status, plus comprehensive configuration and diagnostics via a menu driven user interface. It is possible to connect the FM4000 to EIA-530 or RS-449 equipment using conversion cables. Using a dedicated management timeslot pairs of FM4000s can communicate with each other, allowing configuration and status checking of the remote unit. This application shows an FM4000 connecting an X.21 router card to an E1 G.703 2.048Mbps leased line, such as a BT Megastream-2 service. X.21 serial ports are often the most cost effective WAN port available on routers. Most Telecom carriers provision E1 2.048Mbps services with G.703 connectivity. Care must be taken to ensure that the remote equipment is configured in a compatible manner (i.e. both ends unframed or both ends framed). If the leased line is framed then the equipment at both ends of the leased line must also be framed. This application shows a pair of FM4000 units connecting a pair of X.21 routers via an E1 G.703 2.048Mbps leased line, such as a BT Megastream-2 service. X.21 serial ports are often the most cost effective WAN port available on routers. Most Telecom carriers provision E1 2.048Mbps services with G.703 connectivity. Care must be taken to ensure that the remote equipment is configured in a compatible manner (i.e. both ends unframed or both ends framed). If the leased line is framed then the equipment at both ends of the leased line must also be framed. This application shows an FM4000 connecting an V.35 router card to an E1 G.703 2.048Mbps leased line, such as a BT Megastream-2 service. X.21 serial ports are often the most cost effective WAN port available on routers. Most Telecom carriers provision E1 2.048Mbps services with G.703 connectivity. Care must be taken to ensure that the remote equipment is configured in a compatible manner (i.e. both ends unframed or both ends framed). If the leased line is framed then the equipment at both ends of the leased line must also be framed. This application shows a pair of FM4000 units connecting a pair of V.35 routers via an E1 G.703 2.048Mbps leased line, such as a BT Megastream-2 service. V.35 serial ports are often the most cost effective WAN port available on routers. Most Telecom carriers provision E1 2.048Mbps services with G.703 connectivity. Care must be taken to ensure that the remote equipment is configured in a compatible manner (i.e. both ends unframed or both ends framed). If the leased line is framed then the equipment at both ends of the leased line must also be framed. This application show a remote network management centre controlling the head office FM4000 via an LM1100 SNMP Enabler card allowing comprehensive management access including the full range of configuration changes, diagnostics and status analysis using either SNMP or Telnet, including SNMP traps. In this application a remote management data link has also been enabled to the remote FM4000 unit, allowing remote SNMP and Telnet access into this unit.